Lentets. The most dangerous parasite. Opisthorchiasis - a disease from the group trematodozov caused by parasitic flatworms of the genus Opisthorchis - Opisthorchis felineus (Eng.). Opisthorchiasis distributed in Russia, Ukraine, Kazakhstan and the countries of Southeast Asia. People exposed to infection, and fish-eating animals. Infection occurs by eating raw or insufficiently cooked freshwater fish. The disease is characterized by lesions of the gallbladder and the ducts of the pancreas and liver. 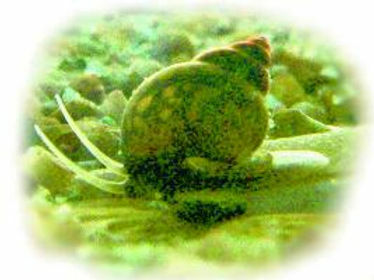 The first intermediate hosts – are freshwater clams Bithyniidae snails kind Codiella, inhabiting ephemeral shallow floodplain reservoirs. Their infection occurs by ingestion of eggs opisthorchis falling into the pond with the feces of final hosts, along with the sludge from the bottom of the pond. In the body of the mollusk a parasite undergoes metamorphosis. This stage of the parasite lasts for 2 months. The resulting cercariae leave the molluscs and actively introduced into the body of carp fish. 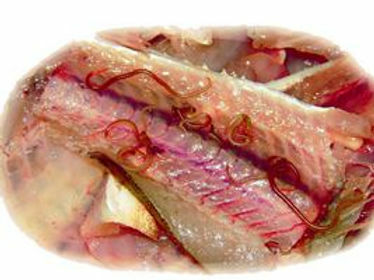 A parasite located in muscle and subcutaneous tissue in the body of the fish. Here it goes to the next stage of development and is transformed into metacercariae, which lies in the gray rounded cyst the size of 0,17-0,21 mm. The larva inside is very mobile. After 6 weeks after infection of fish, a parasite becomes invasive, that is able to infect the final host. 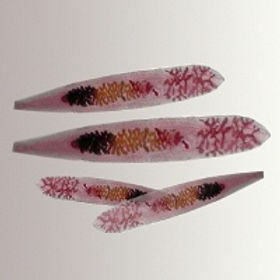 Opisthorchis from all its life stages only a metacercariae is able to take root and multiply in humans and other carnivores. The potential carriers of the larvae of Opisthorchis are ide, dace, roach, rudd, bream, chub, blue bream, white eye, saber fish, chub, tench, gudgeon, bleak, minnow, verkhovka, and studding. The end-hosts of parasites (human, cats, dogs, foxes, arctic foxes, ferrets and other carnivores) infected after eating infested fish. The parasite eggs that fall on the ground, die within 8-10 days, if they enter into the water could survive up to a year. The parasite can in the body of the final host live for 10-20 years. It should be noted that it is not necessary to throw Opisthorchiasis treatment because the clinical picture of the disease may be different for each patient will depend on a complex health condition. Patients with chronic hepatitis opisthorchiasis observed. Intestinal lesions in patients with chronic opisthorchiasis also noted quite often, and the main manifestation is intestinal dyspepsia. Often there are changes in the cardiovascular system, appear heartbeat, pain in the heart, a tendency to hypotension, diffuse degenerative changes of the myocardium according to electrocardiography. Opisthorchiasis can lead to disruption of the central and autonomic nervous system. Everyone should understand that the parasite is the causative agent of various kinds of disorders and diseases. Accordingly, it can directly cause complications and death when weakened immunity. The clinic "YUDJINA" offers a non-surgical medical treatment of various diseases caused by the above parasites, including echinococcosis and alveococcosis. Treatment is carried out the author's original drug developed doctor Lee Evgeny Hynchanovich. The unique author's technique and proprietary products allow Evgeny there be a guaranteed successful treatment. Treatment with drugs, Evgeny Hynchanovich conducted gradually, gently, in a fairly long period, comparable in duration to the development of the disease. During this time, the fight against the disease involves all the organs, improves immunity. Reducing components of drugs heal the lesion of the liver, lungs and other organs, improve their functioning, the disease can be cured completely, throughout the body. We work on weekends and holidays!